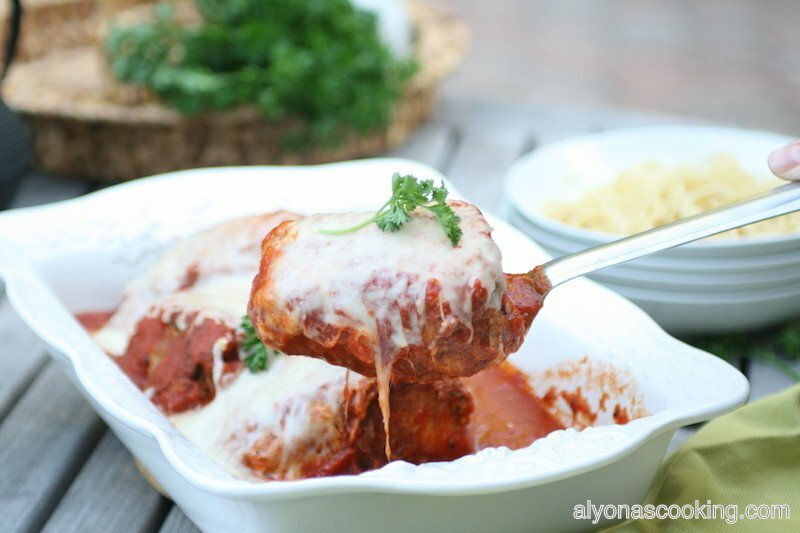 This creamy filled chicken parmesan is so juicy. The filling really enhances the meat. 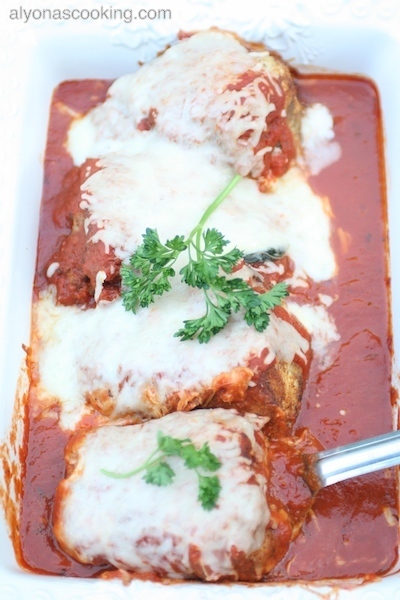 The chicken breasts are stuffed with fresh basil leaves and a creamy blend of cream cheese & muenster cheese. 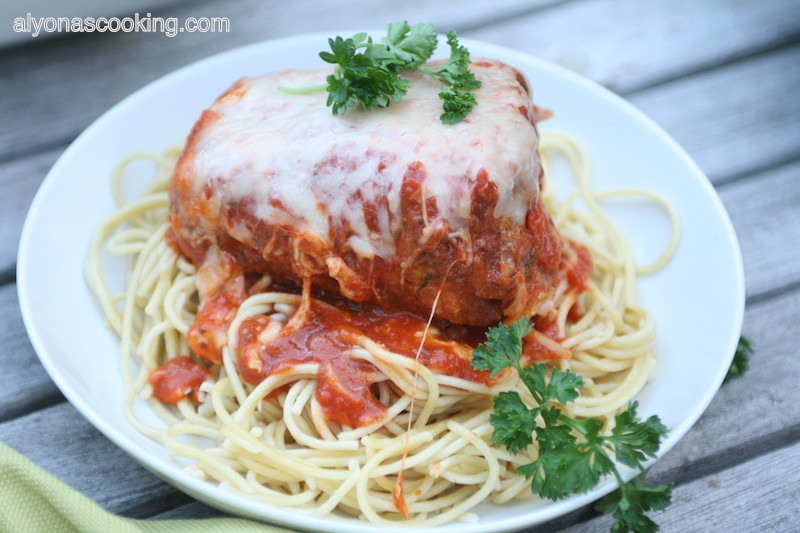 It is then dredged in a combination of ingredients to create a beautiful hard crust and baked away in spaghetti sauce and mozzarella cheese. This dish is fairly easy to prep and the oven does most of the cooking. Serve over cooked spaghetti noodles and enjoy this classic version with a little twist of delicious flavors! The stuffing may seem a little overwhelming with the few extra steps called for than the classic unstuffed version, but I highly recommend to take the few extra steps and stuff the chicken. The stuffed cheese blend definitely enhances all the delicious flavors and the basil adds a nice fresh herbed aroma. My daughter has stated this was her favorite in the world and that she really, really, really loves it. 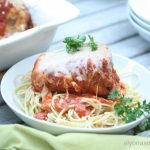 After the chicken is stuffed, rolled and dredged in a combination of ingredients it is slightly frozen for the cheese not to melt as quickly as it would unfrozen. The freezing is crucial so prep beforehand if you want to make this by a specific time. The freezing actually gave me the time to clean up all those dishes to make the rest of the cooking experience neat and clean:) Just an idea… So the next time you want to make a delicious pasta meal, you now have an idea… Enjoy! Comment and rate this dish if you ever get to make it, I would love to know your feedback. Pound each chicken breast thinly (about 10″ long by 7″ wide) in a zip loc bag. Cut the cream cheese in half and then slice each half in half again. You should end up with for pieces of cream cheese. 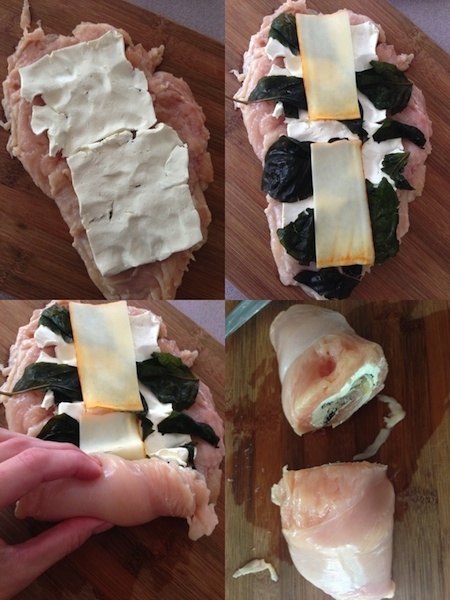 Slightly flatten each piece of cream cheese and place down the center of each chicken breast. Then top with basil leaves and cut one slice of muenster cheese in half and place that on top of the basil. Roll the chicken starting from the smallest end of the chicken breast and repeat with the other piece of chicken. Cut each rolled piece of chicken breast in half and set aside. Arrange three bowls into a row. Into one bowl combine the breadcrumbs, parmesan cheese, salt, pepper, and oregano. In another bowl combine the flour and cornstarch. In the last bowl whisk the eggs together. Dip each rolled piece of chicken into the flour mixture, then into the egg mixture and ending with the the breadcrumb mixture. Place dredged chicken pieces on a large plate and freeze for at least 1 hour. Remove the chicken from the freezer. In a large cast iron pot heat 1 cup of oil over med heat for about 5 min. 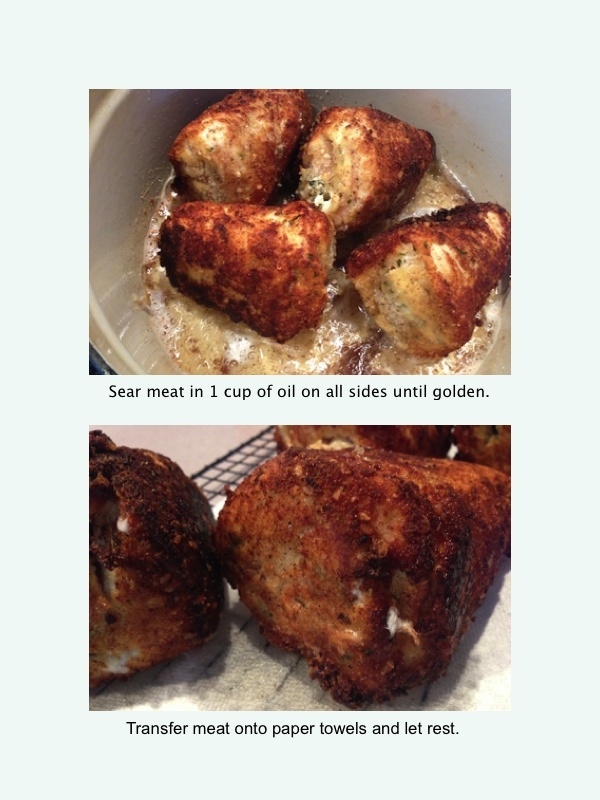 Preheat oven to 375 degrees F. Place seared chicken into a oven safe casserole dish. 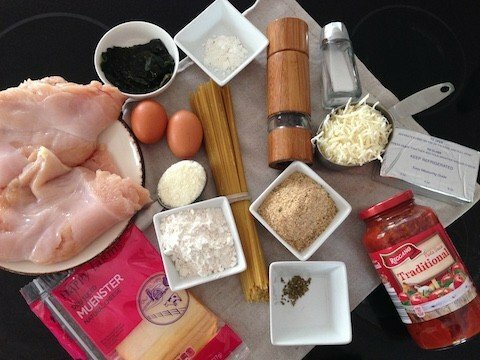 Pour 1 (24 oz) can of your favorite pasta sauce and 1/2 a cup of water over the chicken. 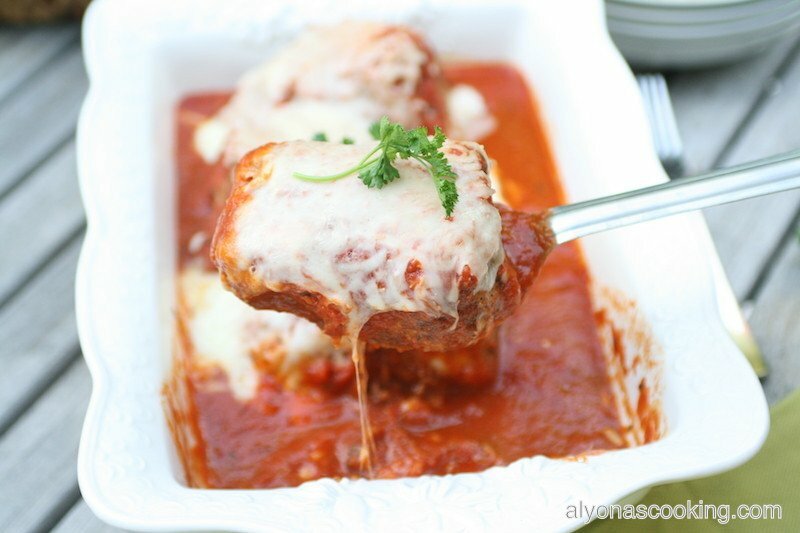 Sprinkle with 1 cup of shredded mozzarella cheese and bake for 30-45 min (or until meat is cooked through). Depending on the thickness of the meat, the baking time may vary. 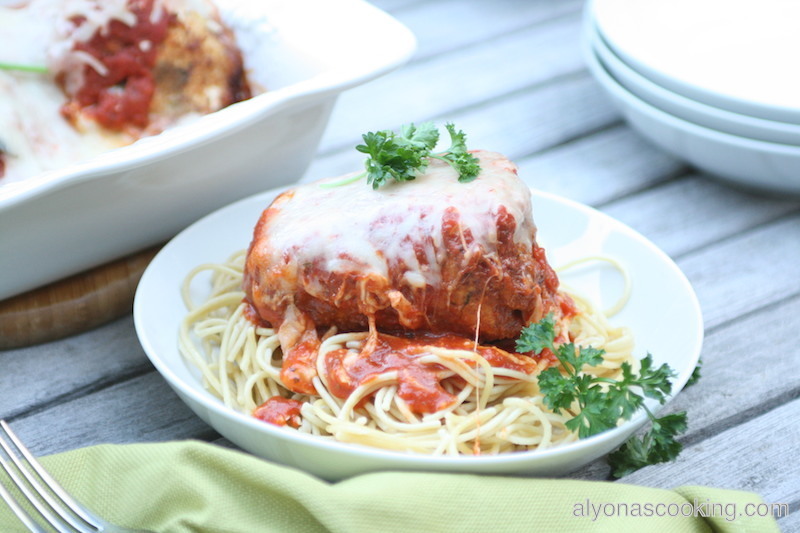 This creamy filled chicken parmesan is so juicy. The filling really enhances the meat. 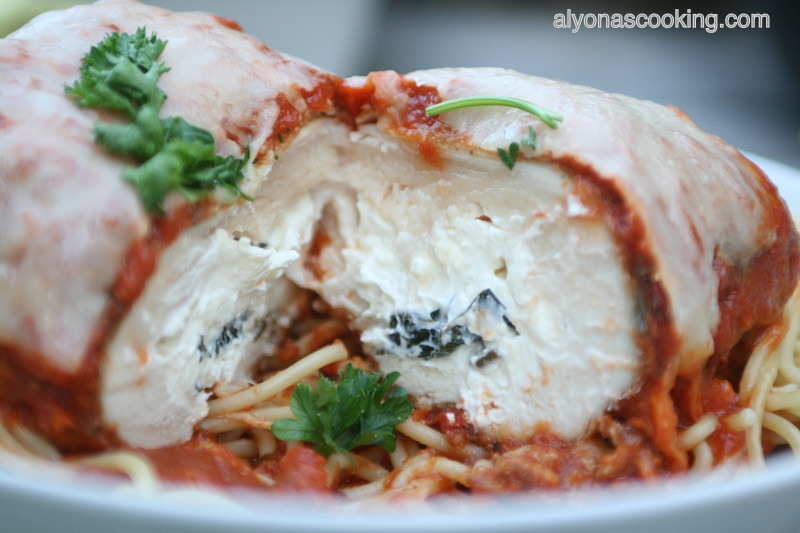 The chicken breasts are stuffed with fresh basil leaves and a creamy blend of cream cheese & muenster cheese. Pound each chicken breast thin in a large zip loc bag. Cut the cream cheese in half and then slice each half in half again. You should end up with for pieces of cream cheese. Slightly flatten each piece of cream cheese and place down the center of each chicken breast. Then top with basil leaves and cut one slice of muenster cheese in half and place that on top of the basil. Roll the chicken starting from the smallest end of the chicken breast and repeat with the other piece of chicken. Cut each rolled piece of chicken breast in half and set aside. Into one bowl combine the breadcrumbs, parmesan cheese, salt, pepper, and oregano. In another bowl combine the flour and cornstarch. In the last bowl whisk the eggs together. 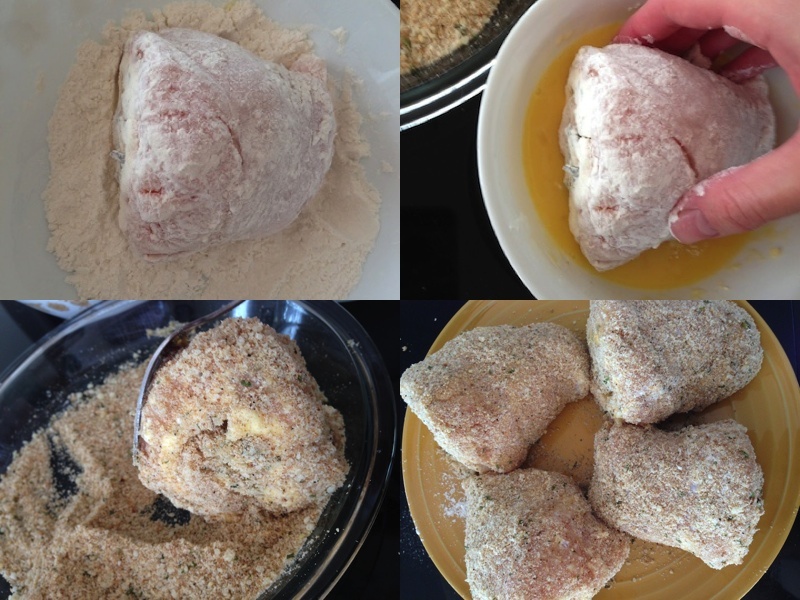 Dip each rolled piece of chicken into the flour mixture, then into the egg mixture and ending with the the breadcrumb mixture. Place dredged chicken pieces on a large plate and freeze for at least 1 hour. Remove the chicken from the freezer. In a large cast iron pot heat 1 cup of oil over med heat for about 5 min. Sear all sides of the chicken rollups and transfer onto paper towels to cool. Preheat oven to 375 degrees F. Place seared chicken into a oven safe casserole dish. Pour 1 (24 oz) can of your favorite pasta sauce and 1/2 a cup of water over the chicken. 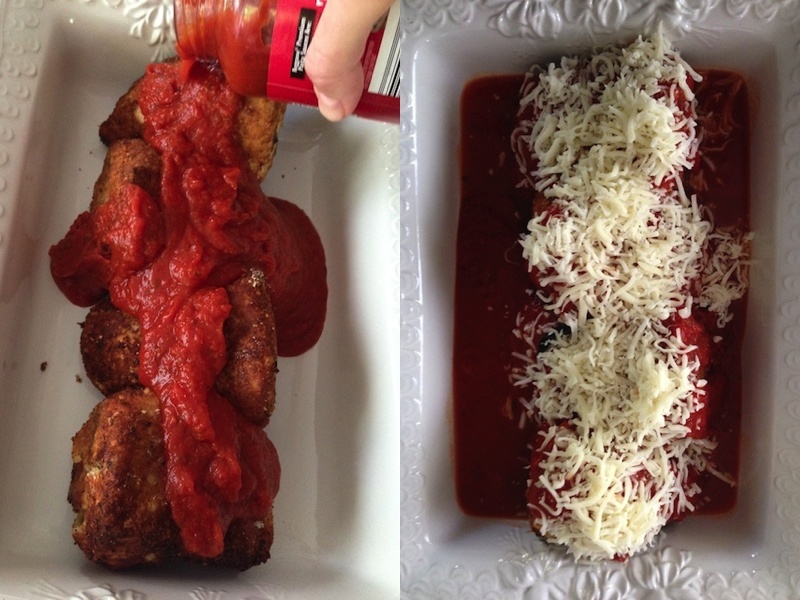 Sprinkle with 1 cup of shredded mozzarella cheese and bake for 30-45 min covered (or until meat is cooked through). Depending on the thickness of the meat, the baking time may vary. This looks amazing! You are making me super hungry at 9am in the morning! I need to try this soon.. Do you freeze your basil leaves? I had a huge plant in my garden and never saved any leaves, so now I am left with none :(. Yours look like they are either dried or frozen.